Daily Forex Market Preview – Following Friday’s strong price action, the markets opened on a weaker note this morning with price gaps across the board. A potential pullback is likely to be taking place ahead of further continuation of the short-term trends. The daily economic calendar is light for the most part today with only the US new home sales data likely to see some reaction in the markets. EURUSD (1.12): EURUSD gapped lower at today’s open and the price action shows a potential for a pull back. 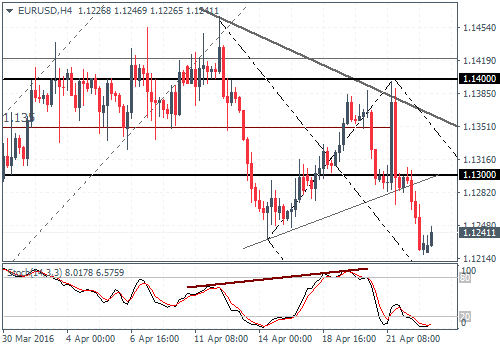 Resistance at 1.13 and support at 1.12 is likely to keep EURUSD ranging between these levels in the near term. On the 4-hour chart, prices broke out to the downside following the consolidation within the triangle pattern. A retest could see EURUSD move back to 1.130 region ahead of a decline to 1.120 support and 1.113 – 1.1105 lower support levels. 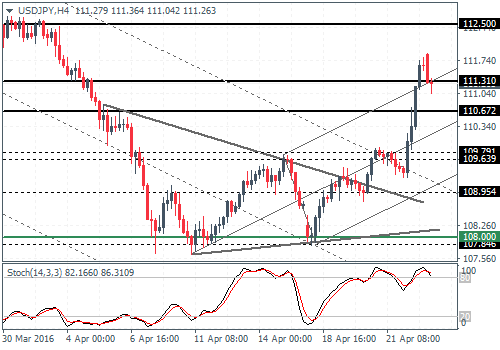 USDJPY (111.2): USDJPY is looking to retrace Friday’s strong gains after prices closed near the 111.4 levels. A pullback could see USDJPY retest the 109 – 108.5 levels which mark the breakout of the daily chart. On the 4-hour timeframe, price action is seen posting a strong reversal near the 111.7 – 111.5 level of support confirming a pull back in USDJPY in the near term. GBPUSD (1.44): GBPUSD gapped higher in today’s session following Friday’s bullish close. 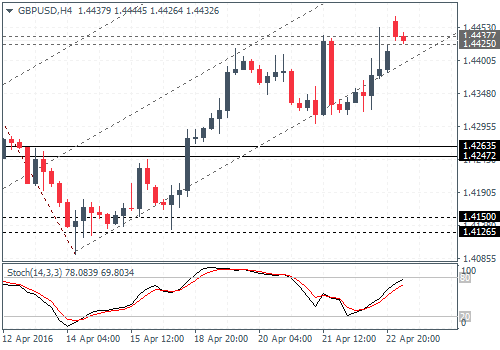 The declines are likely to be limited in the near term, but if prices close below the 1.443 – 1.4425 resistance, GBPUSD could potentially fall towards 1.4263 – 1.424 lower support. The bias remains to the upside so long as GBPUSD does not break below the immediate support level. In the near term, GBPUSD could potentially range sideways within 1.443 – 1.4425 resistance and 1.4263 – 1.4247 support levels. 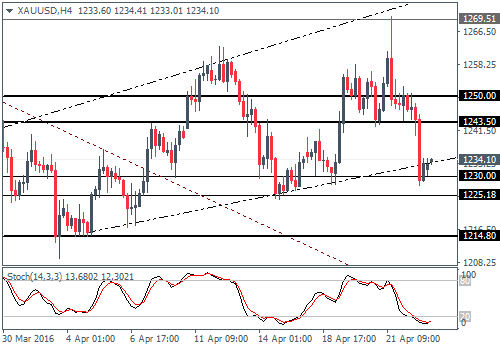 XAUUSD (1234): Gold prices closed on a bearish note following a pin bar on Thursday. Prices are, however, supported near the 1230 – 1225 level indicating a modest pull back. On the 4-hour chart, we can see the consolidation taking place within a broadening wedge pattern. A Pullback could see Gold rally and retest the 1243 – 1250 level to establish resistance ahead of further declines. A break below current support at 1230 – 1225 could see Gold fall towards 1214 – 1210 lower support.